The Pena family is the heart of Vinny’s Transportation. Sandy and Vinny Pena stand behind their daughters Vellenia, 10, Vyahna, 14, and Vanessa, 17. The girls, who are considered co-owners of the business, have been involved from day one. 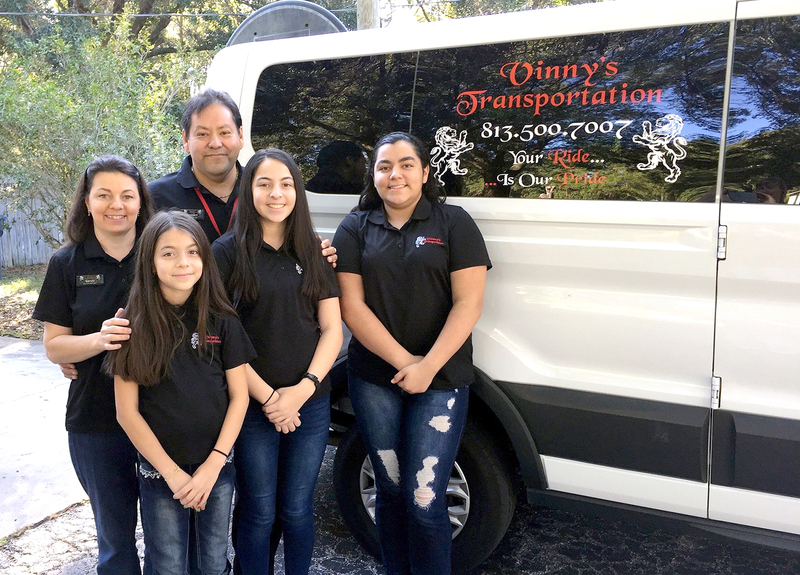 When Vinny Pena and his wife, Sandy, decided to start their own business, they wanted their three daughters involved from the get-go. Pena’s not kidding. Sitting around the kitchen table in their company shirts, the youngsters shared their thoughts. Even the youngest, 10-year-old Vellenia, likes having a role in the company. “I like to tell my friends I’m a business owner,” she said. Pena is quick to point out that the work his kids do is important. This is truly a family of faith. The company was started on prayers, Sandy Pena said. The family needed to buy a home with enough land to park a large van, so the entire family prayed for one. They had placed a bid on the house they now live in, but someone else won. Driving by the house, which had been vacant for more than a year, Pena stopped and talked with some workers and learned the new owner’s name and contact info. He made an offer and the man accepted. 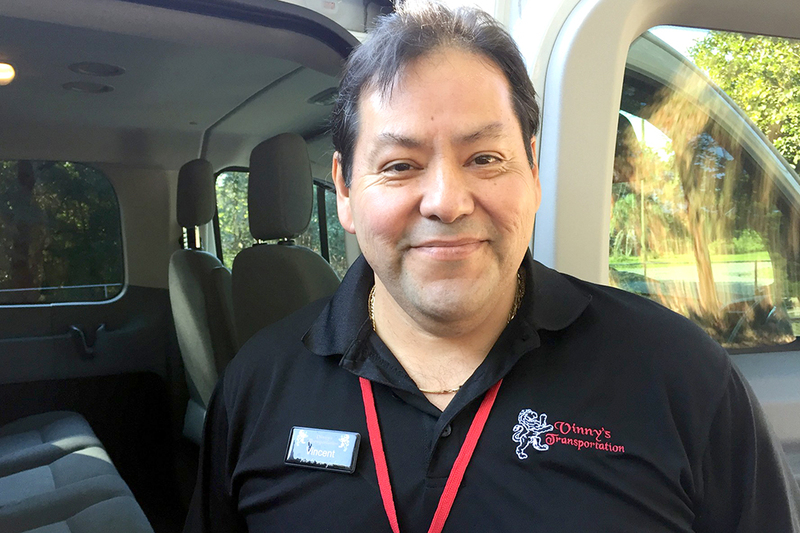 Last May, the Penas purchased a 2015 Ford Transit van, which seats 11 passengers and the driver. The following month they took their first customer from Sun City Center to Tampa International Airport. He paid an introductory fare of $35. Today the cost is $45, which Pena says is below what his competitors charge. A ride to the cruise terminal in Tampa is $40, and additional passengers receive discounts. Group rates are available for six or more folks going to the same destination. Vinny’s Transportation, a member of the Sun City Center, Greater Riverview and SouthShore chambers of commerce, is licensed and commercially insured. He and his wife have Level 2 Federal background checks. Vinny Pena, founder and lead driver of Vinny’s Transportation, thanks the community for the success of his new business, which had its first customer last June. Its response has been so good he’s already is need of a second van. The company’s primary service area includes Hillsborough, Pinellas and Manatee counties, but Pena will consider requests to places like the Sarasota-Bradenton regional Airport. Pena said he has driven more than 1.8 million miles since 1992.
Business has been so good the family is already in the market for another van. “We’ve truly been blessed,” Pena said. “We don’t only give people a ride from Point A to Point B, we also give them safety, peace of mind and satisfaction. To arrange a ride, call 813-500-7007.